Searching for a first class oasis in Morocco? 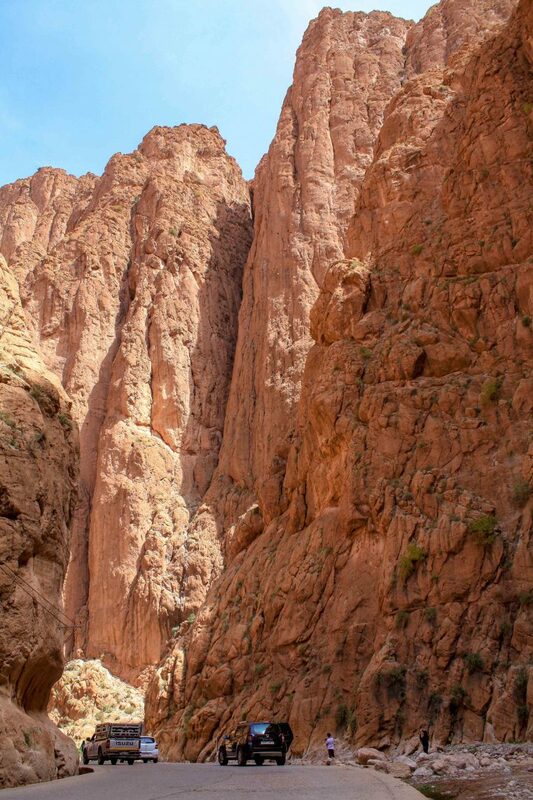 Then you should definitely visit Tinghir and the Todra Gorge! 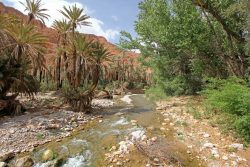 The town is not just known for its immense green palmeries but is also the entrance to the popular Todra Gorge in Morocco. The Todra Canyon is dramatically beautiful and the road is one of the most spectacular ones in this country. 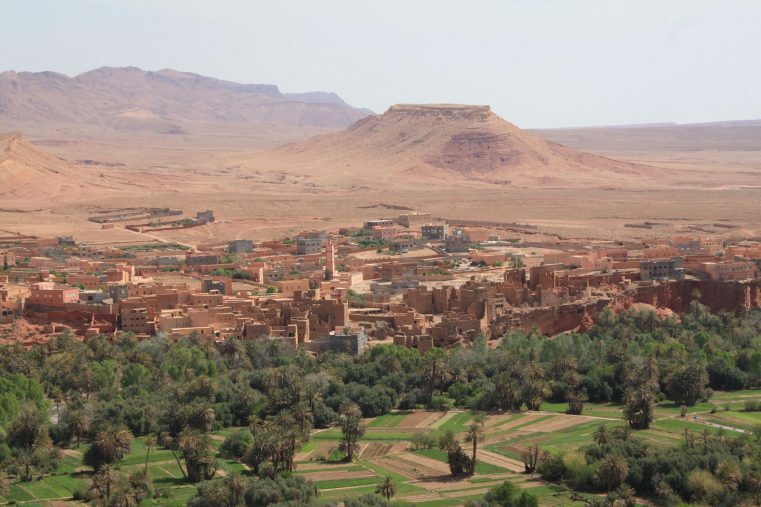 Explore small Berber villages and be astonished by the natural beauty. 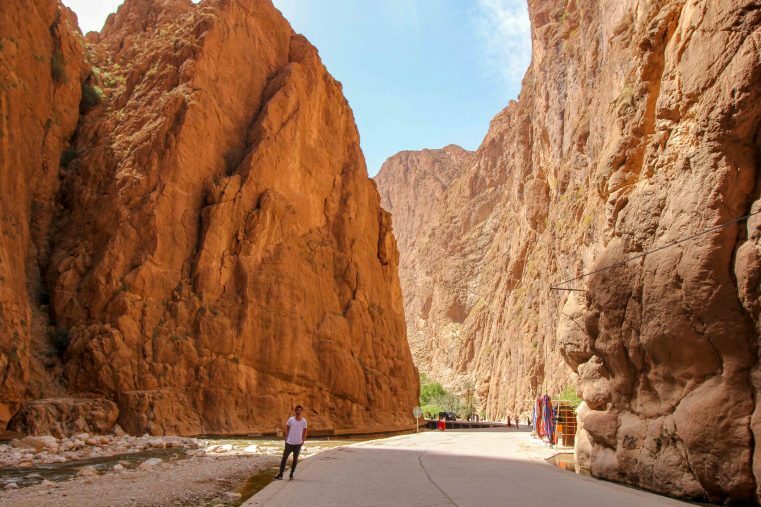 Tinghir and the Todra Gorge are some of the best places to visit in Morocco and for sure one of its most beautiful natural wonders. 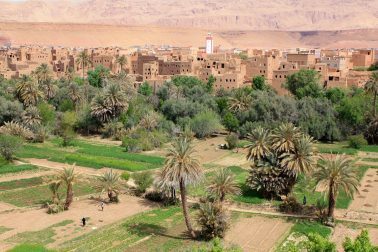 Tinghir is a town with a population of around 44.000 and is located at the center of one of the most impressive oases in southern Morocco! Arriving in Tinghir we made a photo stop at some awesome viewpoint. The scenery was just incredible beautiful and honestly, it was one of the most beautiful oasis we had seen yet. 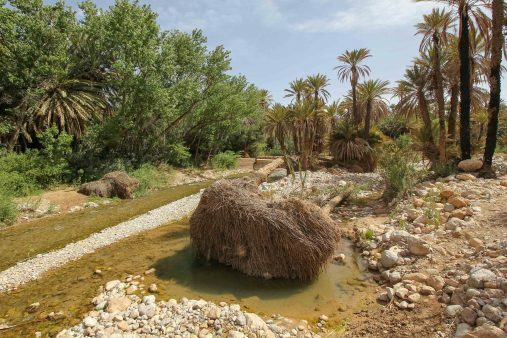 Tinghir Oasis offers some excellent trekking path passing the lush oasis and the green agriculture land! 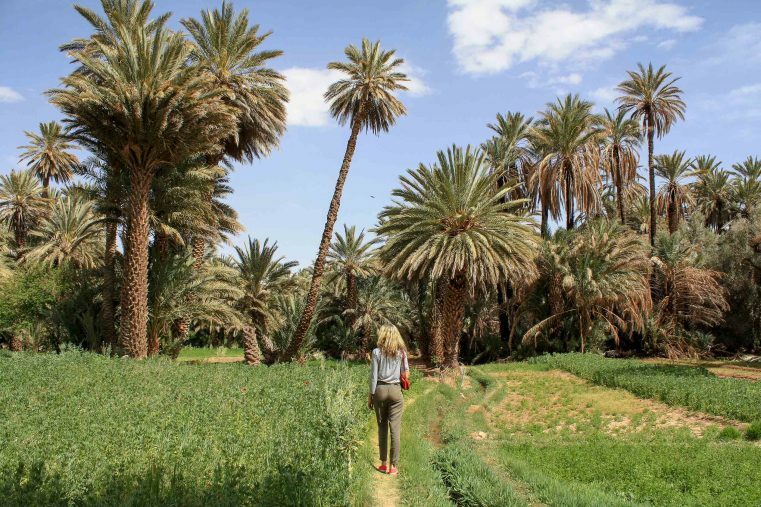 A local guided us the way through the oasis and we got a great impression of the agriculture in this area. Walking on little paths just next to the water canals and watching the local farmers growing their vegetables was quite interesting. The tour took us about one hour and we passed awesome landscapes and had plenty of wonderful views. The main highlight of the oasis tour was when we reached the top of the ancient Kasbah and the view through all the oasis. The paths are not marked, so best you ask at one of the hotels for a guide. Moroccans are very helpful and welcoming and so they won’t hesitate to organize you some help. Most of the tourists only stay for a day but staying there overnight is just wonderful. 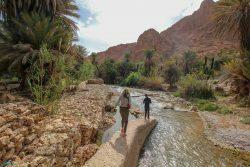 Then you are going to have plenty of time to explore Tinghir and the Todra Gorge and to enjoy the incredibly beautiful surroundings. The Todra Gorge is about 15 km long and the drive inside is really beautiful. The red deep cliffs beside the Todra River have an average height of about 400 meters which makes it one of the most spectacular canyons around the world. Countless awesome views and the contrast between the red rock formations and the lush green oasis is breath taking. We stopped several times to take some photographs and we didn`t get enough of admiring the wonderful scenery. The Todra gorge with its huge rocks is also very popular for rock climbers all over the world. Hundreds of climbing routes were made inside the red solid limestone walls. The most impressive part are the last 600 meters at the end of the Todra Gorge. With just 10 meters from one wall to the other the canyon becomes really narrow. At that part of the gorge, the gigantic red rock walls reach up to 160 meters. The location is really stunning and offers one of the best photo motifs of Morocco. 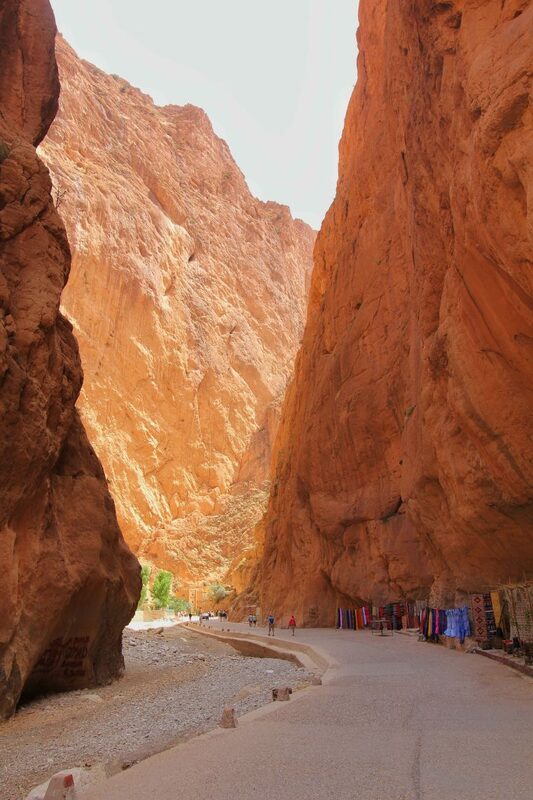 Beware that the Todra Gorge is one of the best things to see in Morocco and therefore is a very popular tourist spot. To avoid the crowds you should explore the gorge in the morning or late afternoon, when the buses are gone. 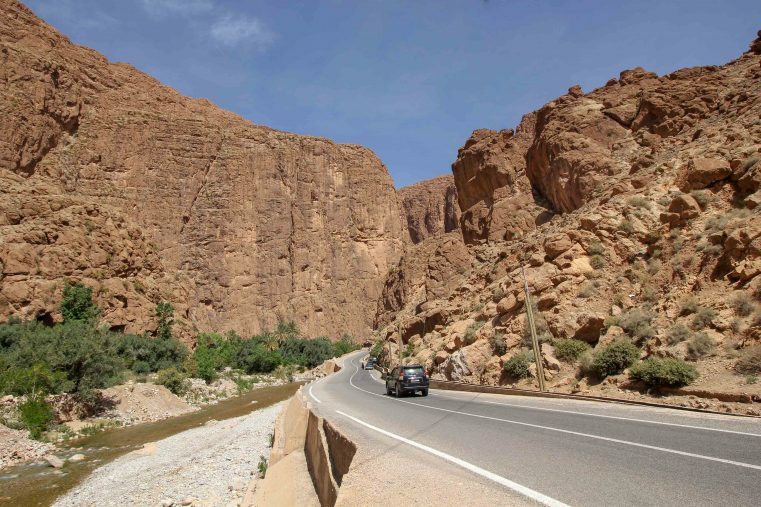 How to get to Tinghir and the Todra Gorge? 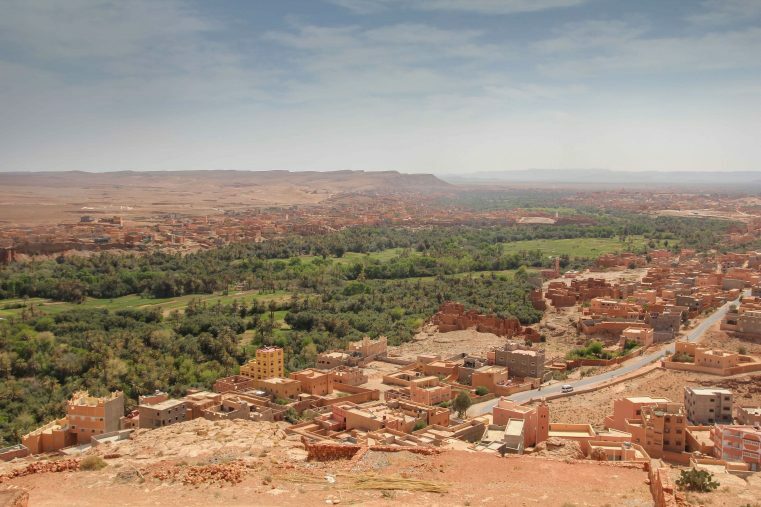 During our 3 weeks self-drive trip through Morocco, we drove from Marrakesh to Tinghir with stops at the incredible town Ait-Ben Haddou, the picturesque Rose Valley and impressive Dades Gorge. The road is also called the „Road of One Thousand Kasbahs“. From Marrakesh to Tinghir it’s about 360 km drive. 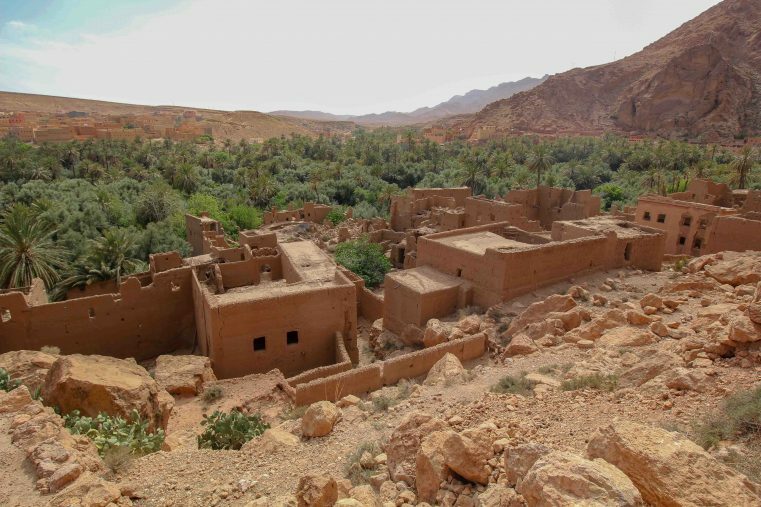 The town is located in the eastern part of the High Atlas region and from Tinghir you have to follow the road for about 15 km. The road is well maintained and it’s safe to drive by your own. Best you rent a car or book one of the several Todra Gorge excursions. 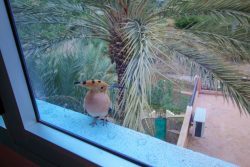 Where to stay at Tinghir and the Todra Gorge? 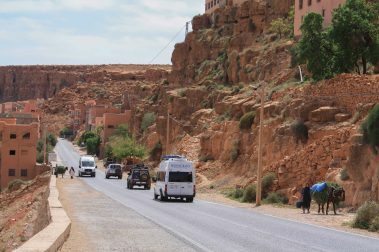 Plenty of hotels and accommodations are located on the way from Tinghir up to the end of the Gorge. We chose to stay at the Kasbah Restaurant Amazir what was actually a great choice. The hotel was very calm and nicely located next to the Todra River. The oasis tour started just nearby the hotel. The rooms are basic but very clean. The terrace is tranquil and a great place to enjoy some original Moroccan mint tea. Also the dinner and breakfast was really tasty too. 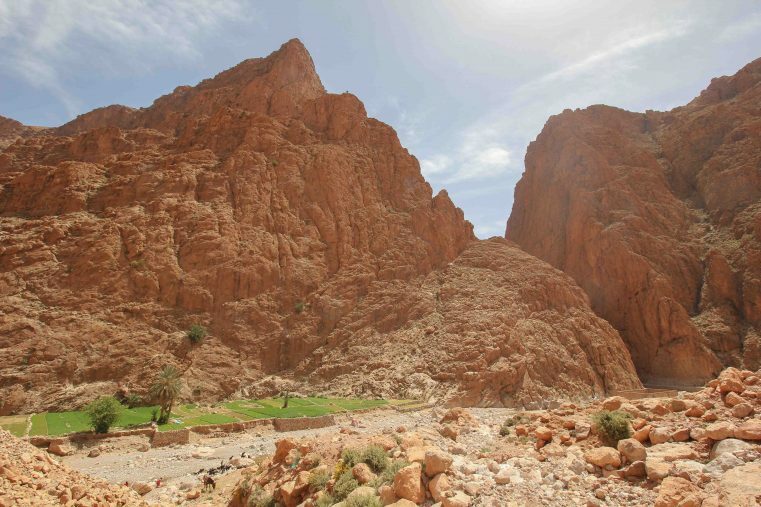 Riad Dar Bab Todra is located at the beginning of the Todra Gorge, 1.8 km from the city center of Tinghir. The property includes an outdoor swimming pool, a garden and a terrace. 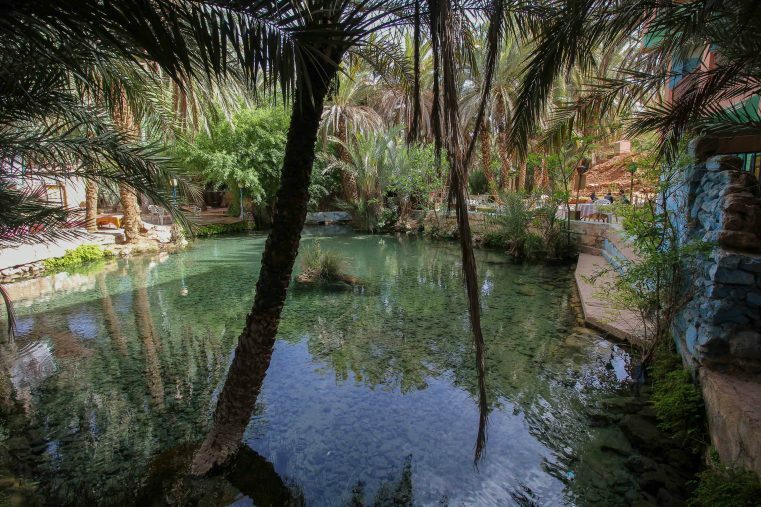 Offering a garden, a terrace and a shared lounge, Kasbah Maison D’hôte Lalla Zahra is set in Aït Baha and is just around 1.4 km from the end of the Todgha Gorge. Another top rated hotel for this area. 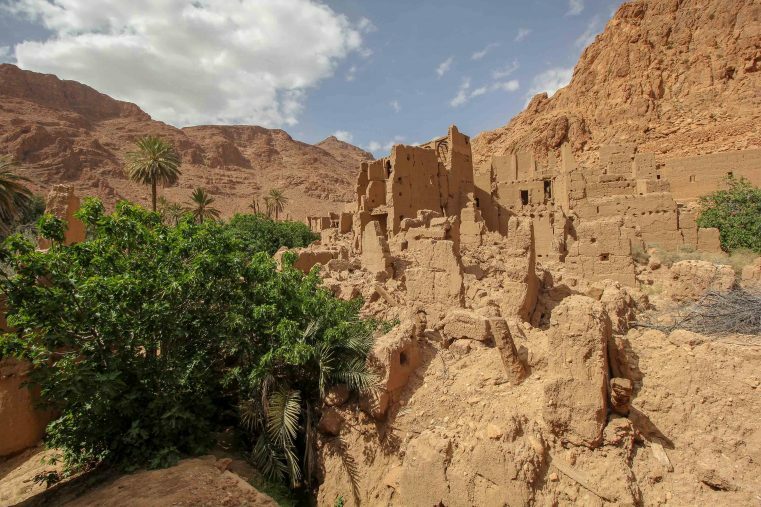 A Secret Garden is located in Tinghir, 2.2 km from the end of the Todra Gorge. Boasting a shared lounge, this property also welcomes guests with a restaurant and a terrace. Wow! Those canyons are simply stunning!! A couple of questions – what month did you travel there? Also, is traveling by campervan a thing here, or better to have a daily rental car and stay at hotels? (Wondering what is culturally and logistically possible). Wow the Oasis looks idyllic. I have never visited one before but it looks very peaceful. 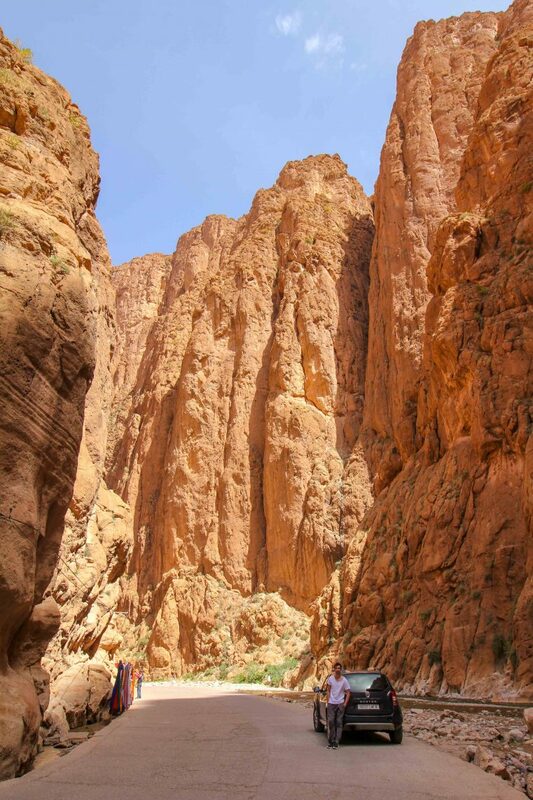 I have also never heard of the Todra Gorge before but would love to visit! Thanks for the tip that due to its popularity it is best to visit early or late. I can believe the gorge is popular with rock climbers but it looks a little bit too high for me! I love the dichotomy of the red rocks and green oasis in Todra. It reminds me a lot of canyons in southern California where you will have dry, arid desert and all of a sudden come upon palm trees. (usually golf courses these days). Of course, the red limestone is even that much more dramatic. Spending a season climbing the routes along the canyon seems fascinating. It looks like there will be endless options and you could find ways to always be climbing in the shade. I love the colours of the rock formations. The red interspersed with the greenery of oases is breath-taking. I had never heard about this gorge until now. It’s spectacular! Will you share your road trip route? Wow what a beautiful place this is! I love the look of the Todra Canyon. I’m sure it was a spectacular drive through to see such high, beautiful cliffs. I love the Moroccan stone desert! I’ve been to Tata and Aka and just loved it. Your post reminds me very much of that trip, but the Todra Canyon looks much more impressive than what I saw. Morocco is like a fairytale.